Leo Tolstoy is a name that needs no introduction. The prolific Russian author, who has a loyal fan following all over the world is certainly a class apart from his contemporaries and even the modern writers. I was first introduced to his short stories during my childhood and he left quite an impression on my nascent mind, as one of the most original and realistic author. Recently, when I saw a voluminous book lying on the library book shelf, with the painting of a sombre old man deeply absorbed in penning down his thoughts on the cover page, I felt an instant liking for him and picked up the book hurriedly. 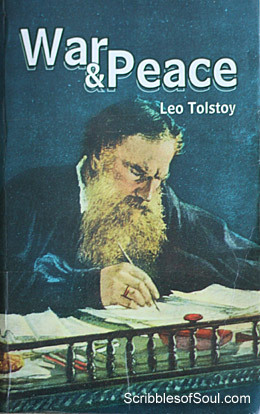 To my utter surprise, it turned out to be the most famous novel of my favorite writer Leo Tolstoy. Yes, I am talking about ‘War and Peace’, an epic, a saga and a worthy treatise of human psychology. The book is 1089 pages long with its three volumes divided into fifteen chapters and two epilogues, spanning across the history of Russia, during 1804 to 1815. The novel belongs to the category of realistic fiction. Leo Tolstoy, with his immense understanding of human mind has woven an enchanting world of real life leaders Napoleon and Tsar Alexander, rubbing shoulders with a number of fictional characters such as Prince Bolkonski, Pierre Bezukhov and Natasha Rostov. He has successfully created an enormous saga, redolent with love, hate, war, peace, enmity and friendship. In short, name a human emotion and you would find it in this never ending tale of love and skirmishes. In the first volume, Tolstoy paints a very realistic picture of the French obsessed Russian Socialites, who discuss everything under the sun in their clubs and drawing room parties, throw lavish dinner buffets and engage in the usual banters and gossips. However, soon it becomes clear that these parties are not simply merry making bashes, but are actually mirror images of the actual battles, where each person belongs to one or the other army, and is playing his or her own game to come on top in the society, by forging alliances, fixing marriages and seeking the company of the well heeled. Those were turbulent times in Russia and with constantly changing political scenario, it was indeed difficult to differentiate between a friend and an enemy and this novel justifiably presents the contradictory actions of the people and leaders of that era. The novel sways between the parties and battles, with both happening rapidly at a break neck speed and I was engrossed in the book for hours, forgetting about my food and ignoring the most important part of my existence (My TV). For more than a month, I followed a rigorous routine to finish off this huge book, which impressed me more and more with every other page presenting a fresh view of humanity. In this mega tale, the characters evolve over a few pages and keep you guessing the next twist in the story. The transformation of ignorant, clumsy, much avoided Pierre to the most sought after rich, philosophical bachelor Count Bezukhov happens almost overnight, when his father dies, leaving him with an immense fortune and envious relations. But, is it going to affect his life positively or whether it would plunge him further into the dark recesses of an inquisitive, idle mind, makes for an interesting read. Similarly, the character of Prince Andrew also grows from a rich, uninterested fellow to an able warrior, a devoted father, a spurned lover to a much maligned man. The novelist very convincingly portrays the transformation of his characters from the frivolous teenagers to dreamy eyed youth to the much experienced adults, who have tasted both failure and success, and can understand the intricacies and ups and downs of the journey called life. Initially, it was slightly hard for me to follow the train of the events, as for the most part, I was a reluctant student of History and had only a vague idea about the French Revolution, Napoleonic Wars, and the various treaties and enmities that existed among Russia, Austria, Germany and France. My superficial knowledge costed me a few pages of the second volume, where the story shifts to the actual battles fought between Napoleon and Alexander and is based on real events, rather than just fiction. In fact, I was little aware of the significance of these events in the world history and could hardly enjoy the vivid picture of War painted by the brilliant Tolstoy in the initial pages of this volume. However, my little knowledge not withstanding, there was no stopping Leo Tolstoy from creating a wonderful world out there that sucked me into its charming webs. Soon, I was googling for the French and Russian wars, updating myself for all the actions, which I had always ignored as a student. If only History was taught as enchantingly as this delectable story, I would definitely have scored higher and understood it better. Anyways, though the novel is essentially historic in nature and slightly difficult to follow, given a liberal use of French and and an excess of similar sounding confusing names such as Rostovs, Denisov,Bezukhovs, Arakcheev, and a plethora of Annas, Peters and Nicholases, still the novel has some ethereal quality that kept me tethered and I am glad that I persevered and was able to enjoy the tongue-in-cheek, sarcastic yet gentle style of Leo Tolstoy. The most amazing thing that mesmerized me was the recurrent theme of war and peace. The civilians seemed to be in a perpetual state of war in their high stress social life, desperately looking for alliances with influential people and seeking worthy spouses, whereas the soldiers find ultimate peace amidst the life threatening bullet showers on the battle ground. Tolstoy has very simply shown that war and peace are just the two states of mind, and you can easily switch over if only you could control your mind and enjoy life in every possible circumstances. For me, this novel is a highly valued classic, an unbeatable, delectable mix of history, fiction and reality. I have already included it in my ‘read again list’ and would highly recommend it to all the serious readers. Definitely, an extraordinary piece of writing that appears fresh and enchanting and continues to bedazzle its readers, even after one hundred and fifty years of its creation! Indeed, a Masterpiece!